BMW X5 Running Costs, MPG, Economy, Reliability, Safety | What Car? In terms of price, the BMW X5 sits roughly mid-way between the cheaper Audi Q7 and Volvo XC90 and the costlier Land Rover Discovery. However, if you want seven seats, adding them to the X5 brings ts price into line with that of the Discovery, which is expected to better retain its value. The X5 has average fuel consumption figures for the class. The diesel 30d gets claimed fuel economy of up to 37.7mpg, with the petrol 40i recording 27.2mpg (both WLTP combined). These figures are very similar the results of the Discovery and XC90, so you’re unlikely to notice a huge difference in the cost to fuel them. With lower CO2 emissions than many rivals, you might think the X5 will be cheap to run as a company car, but in fact its high P11D value means otherwise. Company car tax will cost you more on the X5 than it will on the equivalent Q7 or XC90, although it will at least come in cheaper than the Discovery. Choose the 30d or 40i and you’ll have a choice of two trims: xLine and M Sport. The former gives you leather upholstery, heated front seats, a feature-packed infotainment system, LED headlights and ambient interior lighting. If you upgrade to M Sport, you get sportier body styling, larger alloy wheels and gloss black exterior details instead of polished metal. We don’t think these cosmetic fripperies make it worth the extra cost over the already high-spec xLine, though. The top-of-the-range M50d doesn’t offer any trim choice: its spec list is based on M Sport but with adaptive dampers and steel springs in place of the air suspension. There’s also a bespoke limited-slip differential to increase traction in corners, a sports exhaust system, an upgraded sound system and even larger wheels. We don’t yet have any reliability data for this fourth-generation version, so we can’t say for sure how reliable the X5 will be. What we do know is that BMW as a whole came a mid-table 16th out of 31 manufacturers in our 2018 What Car? Reliability Survey. 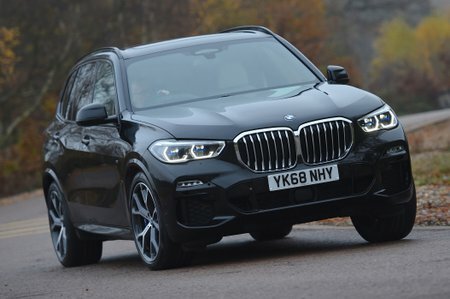 That's still a better result than Audi, Jaguar, Land Rover, Mercedes and Volvo, though, so against its chief rivals, the signs are that the X5 should perform pretty well. The X5 comes with a three-year, unlimited-mileage warranty, which also covers the car’s paintwork for three years and corrosion for 12 years. That’s about the same as most of its rivals, although the Lexus RX offers an even longer warranty. 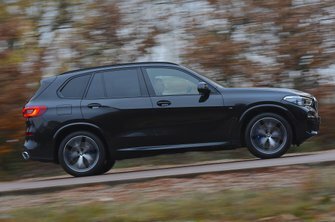 The BMW X5 received a five-star rating from safety expert Euro NCAP, with very impressive results in every test. It even recorded a better result for child occupant protection than the Land Rover Discovery, although the Discovery got a very slightly better result for adult occupant protection. Front collision warning and automatic emergency braking are fitted as standard, but the side airbags don’t reach back into the rear compartment for third-row passengers as they do in the Audi Q7. You can upgrade your X5 with an optional package of driver aids, including a system that can swerve to avoid an obstacle in the road, one to detect traffic crossing behind you as you’re reversing out onto a road, and a system that uses a camera to recognise speed limit signs and can adjust your speed accordingly. The X5 hasn’t yet been rated by security expert Thatcham, though, so its ability to withstand theft attempts is yet to be proven.